SACRAMENTO, CALIFORNIA (February 24, 2016) - The Pacific Challenge Series presented by PenneyLawyers.com teams will have many testing opportunities coming up as the series' 2016 opener is on the horizon for March 19th at Madera Speedway. 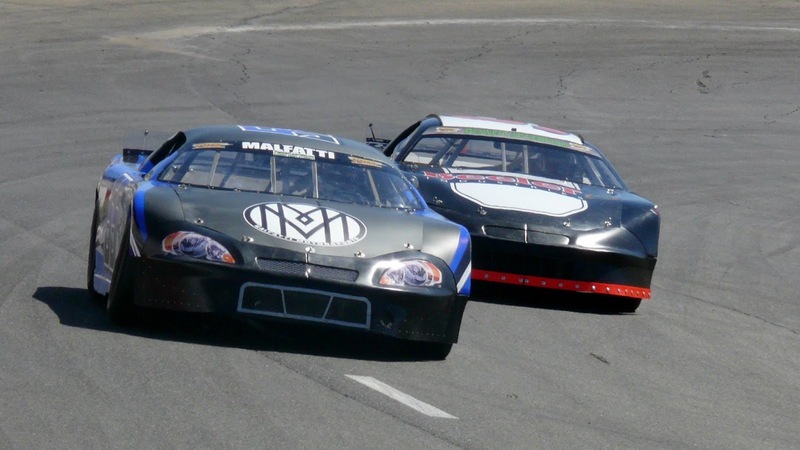 The highly anticipated event at Madera will be televised on MAVTV and is the first of two appearances for the series at the one-third mile asphalt oval. All American Speedway in Roseville, CA is the unofficial "home track" for the PCS with three points races and a non-points race on the card in 2016. Pacific Challenge Series officials will be on hand for the first practice day on March 12th with American Racer Tires and Sunoco Fuel for sale and will also be available to answer any series questions and look at cars. A large contingent of PCS competitors are expected at this practice. Madera will host practice days on February 27th, March 5th, March 11th (Friday night), and March 18th (Friday night before the PCS race). The testing days at Madera Speedway only carry a pit pass fee of $40 per person with no car fees. The Pacific Challenge Series is presented by: Penney Racing Supply, Penney & Associates, American Racer Tires, Maita Chevrolet, Compact-It, Northwest Compactors, Naake Suspension, Sunoco Fuels, Five Star Bodies, Lefthander Chassis, ARP Bodies, Joes Racing Products, Bassett Wheels, Frank's Radio, Racer Bling, and Blakesley Sports Media. All PCS Super Late Models race ABC Bodies or Muscle Car bodies on American Racer Tires with Sunoco Racing Fuel. All teams and fans welcome. Rigs and cars on display. Event Pit Passes will be available for sale. After party, SLM rigs may be parked at racetrack. 8:00am Showdown Parking - No unloading until given the ok.
Showdown Practice will begin as early as 5:00pm, or 20 minutes after the final car has been inspected. Three hours of total Showdown practice. The 2nd Annual Winter Showdown is this weekend at Kern County Raceway, in Bakersfield, California. The weekend’s main event is the Sunday afternoon, $30,000 to win, “SPEARS Manufacturing Winter Showdown 250” for Super Late Models/Tour Cars. The weekend begins on Saturday night at the paved half-mile with the “51 FIFTY Energy Drink Opening Night”, featuring the Lucas Oil Modifieds and Race for Autism Qualifying Races. The “Winter Showdown Kick Off Party” at TEMBLOR Brewing Company at 3200-Buck Owens Boulevard presented by “Visit Bakersfield” on Thursday evening starting at 5pm. Race team rigs and cars will be on display. Great food and drink, driver interviews, autographs and raffle prizes. Free to everyone and all ages welcome. More than 80 teams will move into Kern County Raceway for Winter Showdown tech inspection with Lucas Oil Modified practice starting at 2pm. The Dirt Track at Kern County Raceway Park, located just outside of the paved half-mile oval, will host the final race of the 2016 Winter Series on Friday night. Dirt Modifieds, B-Mods, Hobby Stocks, American Stocks, and Mod Lites will be in action on the new 1/3 mile clay oval. Gates at 4:30, Racing at 7:30. Tickets are $10. Kids five and under are FREE. The competition on the paved half-mile begins with the “51 FIFTY Energy Drink Opening Night”, featuring single car qualifying, the 80 lap - Lucas Oil Modifieds feature event, plus the “Race for Autism - Qualifying Races” and the “Fast 12 Heat” - featuring the fastest 12 drivers from qualifying, competing for the top 12 starting positions for Sunday’s SPEARS Manufacturing Winter Showdown 250. Spectator Gates 2:30pm, Lucas Oil Modified Qualifying 3:30pm, Showdown Qualifying 5pm, Opening Ceremonies at 6pm. General Admission $15, Kids 10 & under Free. Reserved Seating $25. The main event of the weekend will be the Sunday afternoon, $30,000 to win, “SPEARS Manufacturing Winter Showdown 250” for Super Late Models 1:30pm. The racing will start off Sunday with in the “Pinnacle Peak Steakhouse Last Chance Race” at 12:30pm, where teams will be racing for the final three starting positions in the SPEARS Manufacturing Winter Showdown 250. Spectator Gates 10am, Showdown Last Chance Race 12:30pm, the SPEARS Manufacturing Winter Showdown 250 Opening Ceremonies 1:30pm. Dinner Suggestions: Buck Owen’s Crystal Palace, Benji’s Basque Restaurant, Double Tree Hotel, Black Angus, TEMBLOR, Chuy’s, Road House Grill, Padre Hotel. For Kids: ‘Rush’ – Indoor Trampoline Park, located next to TEMBLOR. General RV parking still available at Kern County Raceway for $50 for the entire weekend, or track side RV spots for $500. Visit http://www.kernraceway.com/#!rv-parking-forms/igg9h for RV information. Kern County Raceway Park's 2nd annual Spears Manufacturing Winter Showdown is set to receive the green flag this Friday and Saturday, February 27th and 28th. It has already being regarded as the hottest ticket on the left coast. In fact, this ticket is so hot you will practically need protective asbestos gloves just to hold it your hand. Quite frankly, don't be too surprised if this event turns out to be the left coast's hottest ticket of the 2016 racing season. There's a lengthy list of reasons regarding why this event has such a high anticipation level. Here's some major bullet points that clearly says all lovers of short track stock car racing should make plans to spend next weekend in Bakersfield, California. *The Winter Showdown will be anchored by the SRL Super Late Models/Tour Cars featuring some of the finest driving talent from all over the nation. At press time the reported pre entry car count was a little over 50 cars vying for 36 starting berths. That means the qualifying races, and the last chance race, are going to show us intense on track action. *The weekend's co-anchor is the extremely popular Lucas Oil Modified Racing Series, presented by Loan Mart. At press time their pre entry car count was reported to be around 30 teams. This very exciting series has been filling up grandstand seats all over the left coast area for several years now. *The Winter Showdown has a total purse of $180,000 and that's why race teams are traveling all across the nation to spend this weekend in Bakersfield. Sunday's 250 lap Super Late Model main event pays a whopping $30,000 to win. The winner of Saturday's Lucas Oil Modified 80 lap main will be collecting a series high $5,000. With money like that on the line the racing will be intense. *On Saturday, the Winter Showdown opening night, the Super Late Models will begin their day with qualifying beginning at 5pm. The fastest 12 drivers on the time sheet will be locked into Sunday's main event. The driver at the top of the qualifying charts will earn a $2,000 bonus check. Those top 12 drivers will then compete in a fast heat event to determine their starting positions for Sunday's main event. The remainder of the teams will use their posted time to determine the line up for three Race For Autism qualifying races. The result of those qualifying events will locked in positions 13 to 31 for Sunday's main event. With $30,000 going to the main event winner, fans can expect a high level of intensity during these qualifying procedures. *The Lucas Oil Modified Racing Series will be running an 80 lap event on Saturday night. This main event will be divided into twin 40 lap segments. The aforementioned Super Late Model qualifying races will be held between the modified races. Over the past decade, this series has hit amazing heights in terms of delivering competitive racing that packs grandstands at every racing venue they visit. The series has a balance of seasoned veterans and young drivers looking to launch and further their racing careers. With a series high paycheck of $5,000 going to the winner, look for some hard racing from this group on Saturday night. *Sunday, day two of the Winter Showdown, begins with an even higher level of potential intensity. The day begins at 1230pm with the last chance race, for the Super Late Models, sponsored by the Pinnacle Peak Steakhouse and its two locations in the communities of Colton and San Dimas. How intense is this race going to get? There could be as many as 15 to 20 cars in this race with only the top three transferring to the big money 250 lap main later in the day. With ten laps remaining in this race the yellow caution flag will come out allowing the top three transfers to go to the pits to prepare their cars for the main event. The drivers remaining in the last chance race will run a ten lap shootout with the winner collecting $2,000. The last chance transfers will lock down starting positions 32 through 34. Positions 35 and 36 will be set by provisional determined by SRL officials. *Next comes the grand finale. 36 Super Late Models running 250 laps on the Kern County Raceway Park's high banked half mile oval. When the checkered flag falls over the Winter Showdown 250, some lucky driver standing in victory lane is going to be presented with a check for $30,000. *The Winter Showdown will also be presenting a bonus check to one of five eligible drivers. The driver who scores the best finish in the Winter Showdown 250 will receive a $10,000 bonus check. By way of their performances in the recently held Snowball Derby, a Speed 51.Com Internet fan vote and being the 2015 Winter Showdown winner, the five drivers eligible for this bonus are: Bubba Pollard, Cole Anderson, Donnie Wilson, Dalton Sargeant and Preston Peltier. Of special interest here is driver Donnie Wilson who recently said if he won the $10,000 bonus he would donate it to the St Jude's Children Hospital. The Showdown bonus program is being sponsored by: Sunoco Race Fuels, 5 Star Bodies, Progressive Racing Engines, Hoosier Tire West, Hammer Racing Engines, Coors Light, The Spears Southwest Tour Series and the Evergreen Speedway. *Racing fans are invited to attend the Winter Showdown Kick Off Party, on Thursday, February 25th, at the Temblor Brewing Company located at 3200 Buck Owens Boulevard. The party, 5 to 7pm, will feature great food and drink, driver interviews, autograph opportunity and raffle prizes. Also race team rigs will be on display. The party if free to all and all ages are welcome. *If you're looking for something to do on Friday night, during your Bakersfield racing weekend, the Kern County Raceway Park's still relatively new one third mile dirt track will be presenting the final round of their Winter Series featuring the Modified, B-Mod, Hobby Stock, American Stock and Mod Lite divisions. Race time is 730pm. *The Kern County Raceway Park has always been considered to be a fan friendly facility that combines good racing shows with budget friendly ticket prices. Tickets for the Saturday edition of the Winter Showdown range from $15 to $25. The opening day is being sponsored by 51 Fifty Energy Drink. Fans can present an empty 51 Fifty can at the ticket gate and get into the grandstands for only $10. The energy drink is sold at all Sav Mart stores in the Bakersfield area. Tickets for Sunday range from $25 to $35 and are currently being sold online at www.kernraceway.com/#tickets/c/cuz. Again, considering all of the racing action you're going to see, those are actually very fair prices. *If you can't make it to Bakersfield this weekend you can still catch the live racing action via Speed 51.Com's Pay Per View coverage. Saturday's PPV rate is $19.99 and features live coverage of the Lucas Oil Modified's 80 lap main event as well as the Super Late Model qualifying races. Sunday's PPV rate is $24.99 and includes the Pinnacle Peak Steak House last chance race and the Winter Showdown 250 as well as a full pre and post race show. You can also order the two day broadcast package for $34.99 and save $10. *Also in the racing media news is the fact that the award winning Lucas Oil Production Studios will be at the Winter Showdown video taping on both days to be aired nationally, on a future date to be announced, on MAV TV which is also owned and operated by Lucas Oil. So there you have it, an entire list explaining why the 2016 Winter Showdown is this weekend's hot racing tickets and possibly even the hot ticket of the year. Enjoy your weekend at the Kern County Raceway Park fellow racing fans. It's going to be spectacular.